Control connected lamps, fans and other appliances using Siri commands directly from your iOS device without launching the Home app. 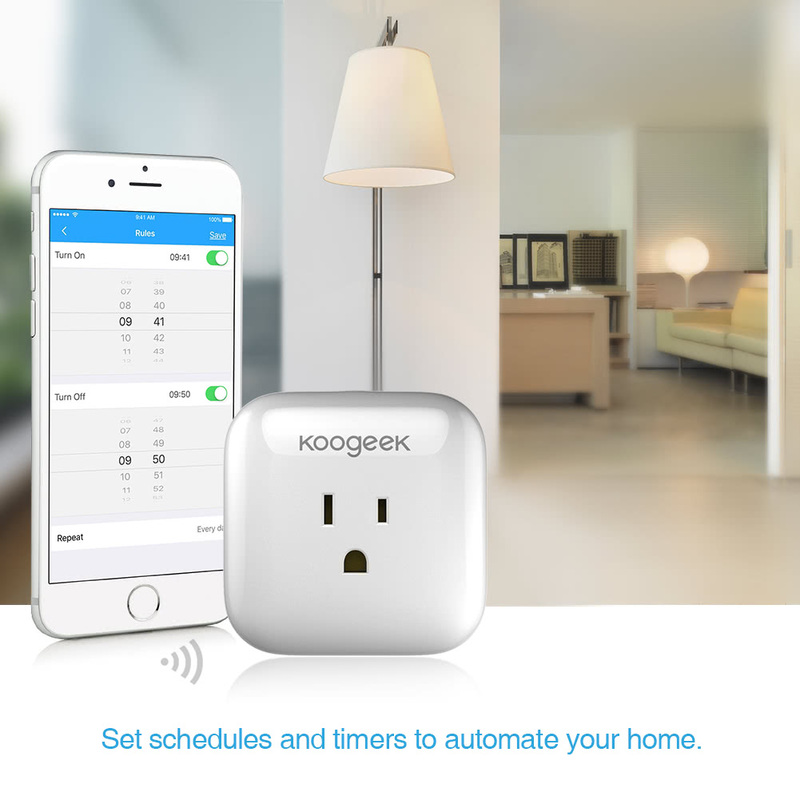 With the Koogeek Home app, you can easily control, monitor and schedule any connected device from anywhere through easy setup. Compatible with iPhone, iPad and iPod touch running iOS 9.0 or later versions. 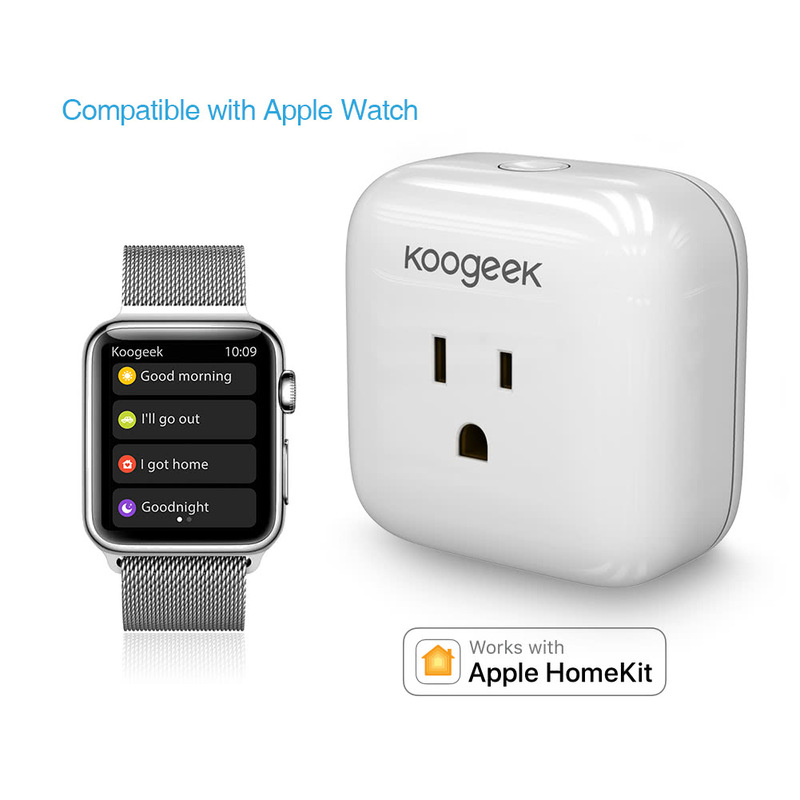 It is also the world's first HomeKit-enabled device that supports control from your Apple Watch. You can set up your Apple TV (4th generation or later, with tvOS 10.1 or later) or iPad (with iOS 10.1 or later) as a home hub, and control connected devices remotely wherever you have Internet access, grant access to the people you trust and automate connected devices or scenes to turn on or off through triggers such as time of day, location, HomeKit-enabled sensor detection, or the action of a HomeKit accessory. Why can't I control it with my phone when using cellular data? How much power does this unit consume? can i set the timer to go on/off with google assistant ? Can ship to Taiwan ? ? Can two phones control one plug? of course, After you group your accessories in a home, you can invite other people to share control of these accessories. People need to sign in to iCloud to accept the invitation. If you create the home, you're the administrator. People you invite are shared users. If there's a power outage, when the power comes back on, will it turn on automatically ? thanks for asking, we will ship your item from our US warehouse, which is located in California, you will receive it within a week. Has anyone had problems with these plugs constantly becoming unresponsive? Also, kicking other devices out of the network as well? Does this have a dimmer function, like I've seen on some other products, or just on/off? Thanks. This is a plug, impossible to function a a dimmer. How could it be possible? Just on/off, as any other common plug. 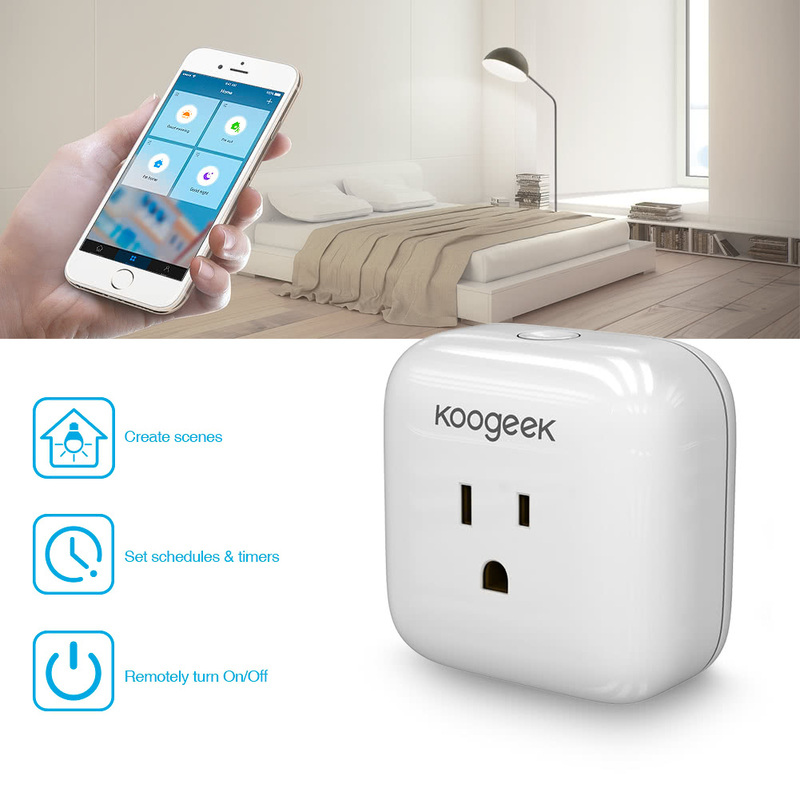 We purchased this socket from Koogeek and controlled the floor lamp via a smartphone. We also want to test the future Smarthome and buy a socket that can be controlled by a smartphone. With HomeKit being relatively easy to connect to the outlet, we started using SmartHome for some initial experience. We currently have a floor lamp connected to the outlet. I also found an interesting feature that sees the power consumption of the connected consumer. The hardware works very well, the installation is simple and fast, completely autonomous, because it connects to WiFi. Thanks to HomeKit and Siri, you can turn it off and open it with sound, which is very convenient. I use it as a desk lamp. I told HomeKit to turn on my desk lamp, which happened to happen. very cool. It's easy to connect to your phone, perfect for Apple's home. It determines the power consumption and allows you to activate and deactivate the socket remotely. Use it to turn on and off the lights with Amazon alexa, which works great and looks modern. Definitely recommend it. Excellent product, you can set the switching time. 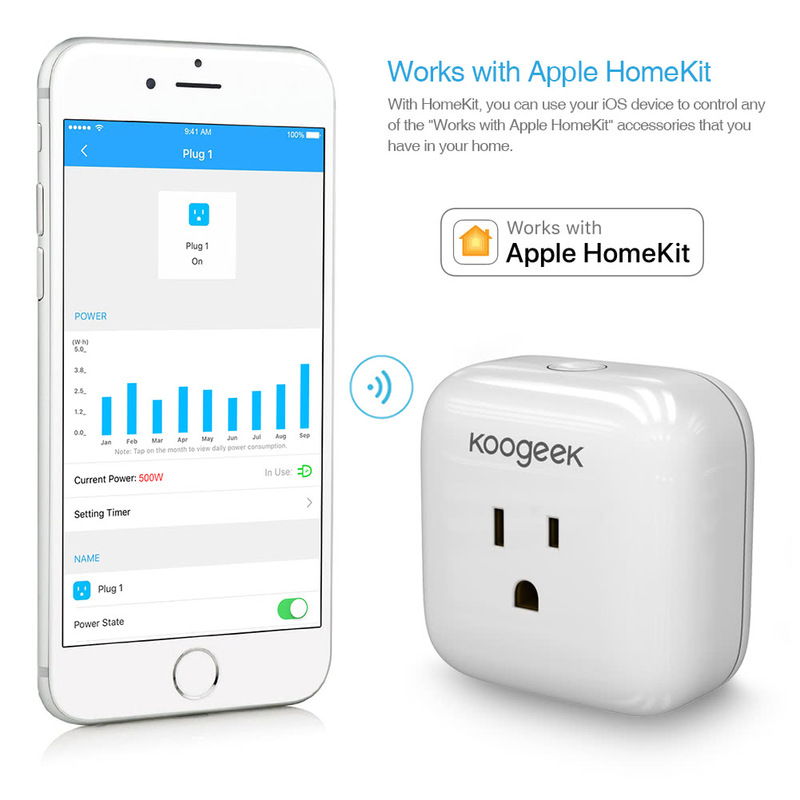 Compatible with HomeKit, simplifying the use of different devices in your home. 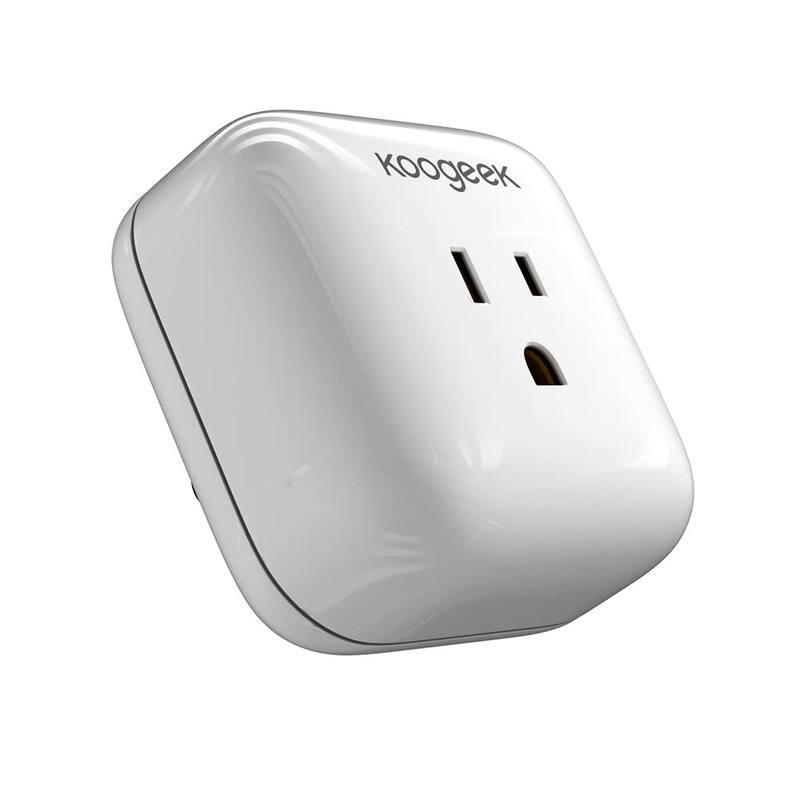 The smart plug from Koogeek arrived packed in a nice box 2 days earlier than expected. I was very excited to receive it and tested the same day. The plug itself has nothing fancy just 1 button and 1 LED light which is On when connected to a power source. The smart thing is an app and ability to apply its features using wi-fi the way you need or want. I plan to install it on my TV section that include DVD player, audio center, TV, printer, and some other items connected to the same power source. Once I am off the TV all I need to do is take my iPhone and say "turn off TV" and all section will be turned off. The app is easy to install and is simple enough to use. You can set time frames, sections, areas, rooms to control and you can see the power consumption per each plug. 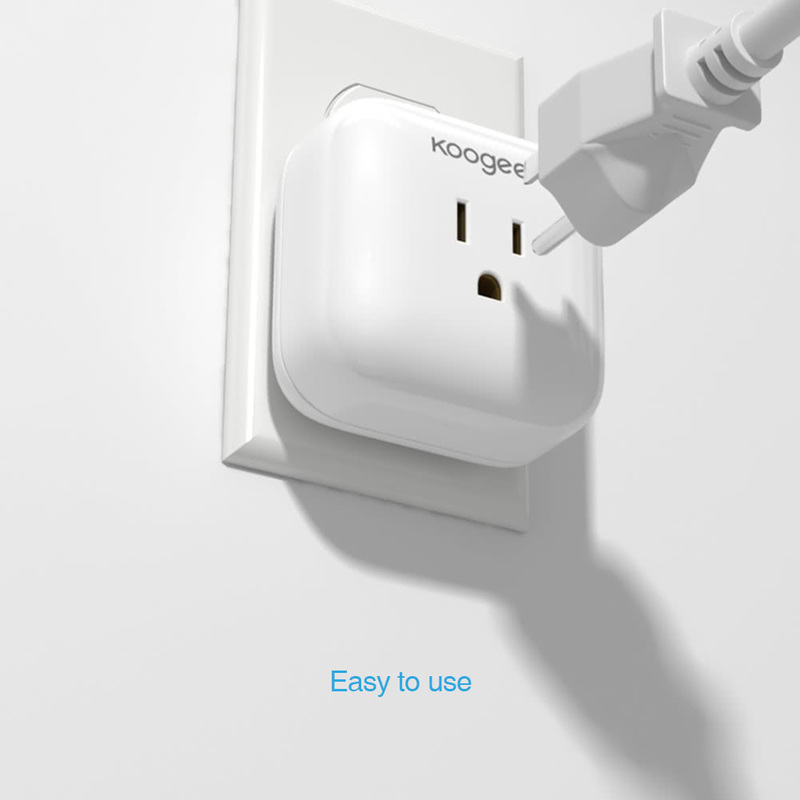 Overall, my experience with the Koogeen smart plug is been great, I will recommend this product. See the video how the smart plug is packed, how does it feel and look, and see a small test made with a lamp. There are a lot of smart plugs on the market these days and the market is starting to saturate for Apple Home Kit comparable devices. On the MacSources test bench, today is a smart plug offering from Koogeek. The first thing I noticed about this plug is its sleek design. While this is not a necessary attribute for a functional smart plug, some users may appreciate this if the plug will be in a visible area. 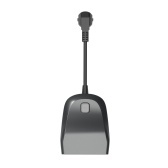 The plug is white and curvy, with a recessed power button on top. 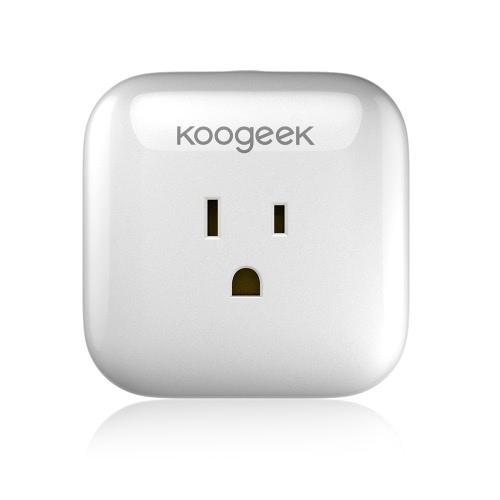 The only other markings are the Koogeek branding on the front of the plug. 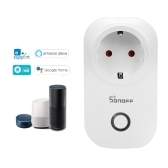 This smart plug is current in beta, so the app and associated HomeKit functionality are not yet available in the app store. 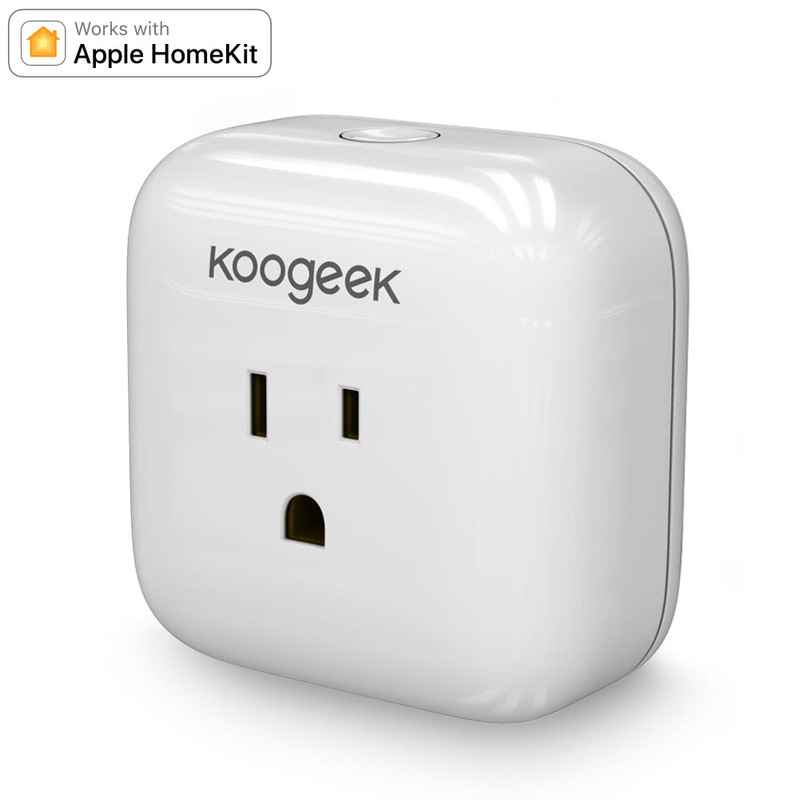 MacSources was provided a beta tester link in other to install the Koogeek Home app and test the device. 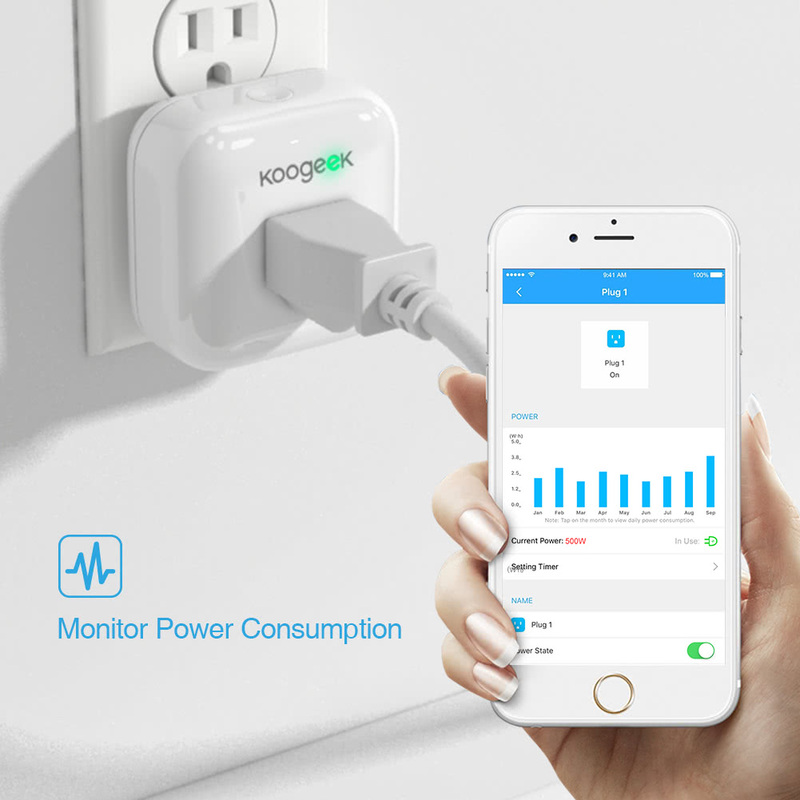 All in all, the smart plug by Koogeek is a solid product that holds it’s own in a sea of competitors. The stand out feature for me is the slick interface and ease of operation. I am pleased with this purchase. The product performs exactly as described. Price was very reasonable and, if we need another one, will purchase it again. 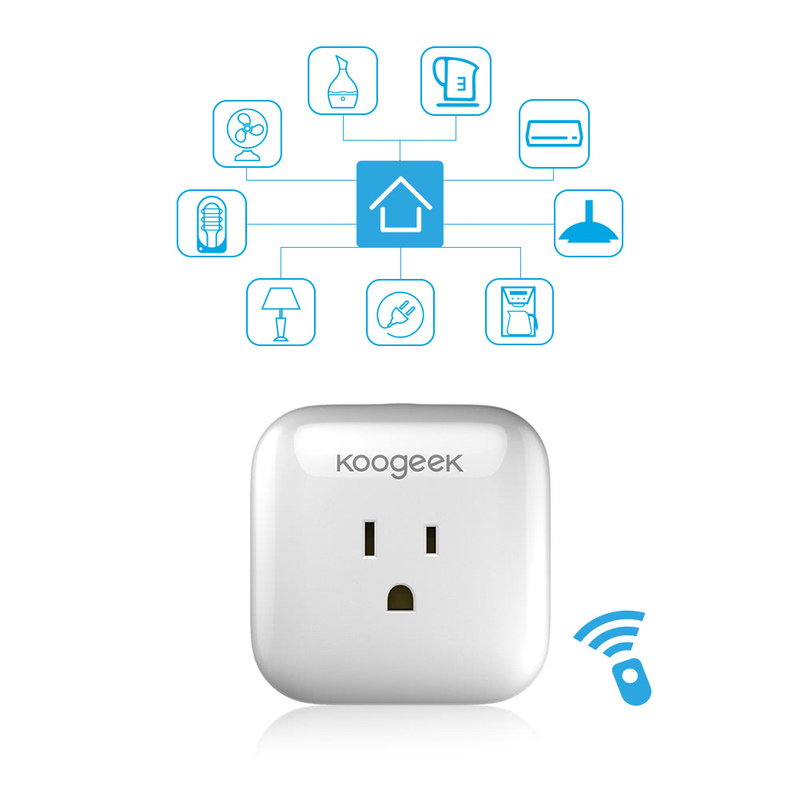 I found this Koogeek WiFi smart plug very easy to set up and use. It comes with a manual that walks you through each step. There is a free app to download for set up and use. 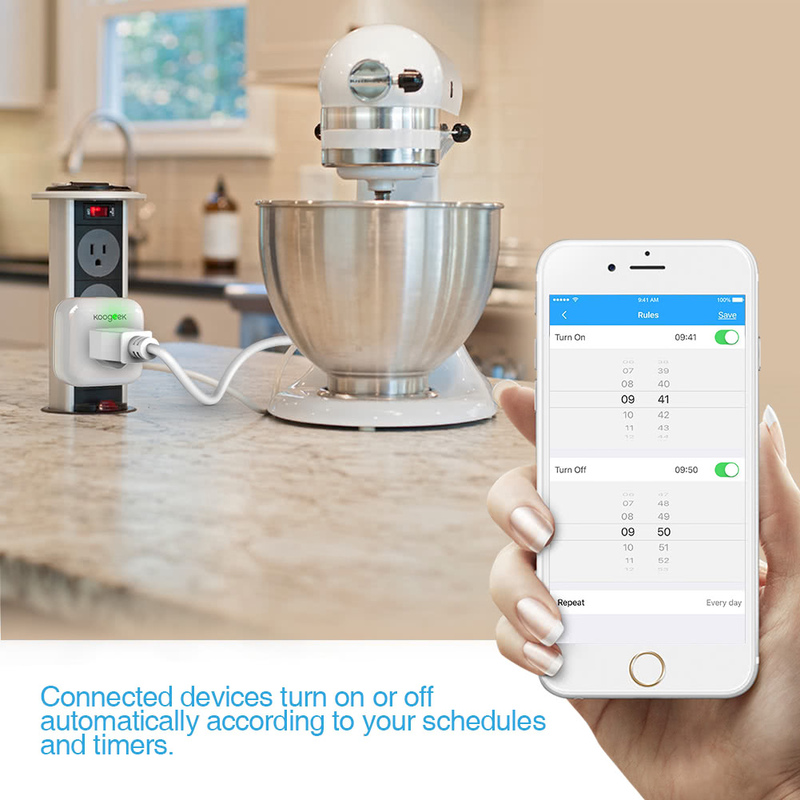 The app is also simple to use and allows you to simply turn the plug on and off or to set up a program. 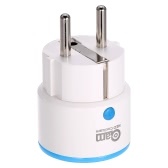 The smart plug is 2.5” by 2.5” and has a ground. There is a small light hidden in the Koodgeek logo on the top and this will blink red or green when it is being set up. Moving the plug from one outlet to another means it loses it's WiFi connection but when plugged back in, the quickly finds it's WiFi settings. This plug does not work with all electronic items. I have several touch lamps that I can turn off but not on. Apparently the touch switches still need to be turned on. Everything else that I have this plug with works perfectly. This is a fun device! Years ago, we were really into X-10 home automation... but the house we purchased about 6 years ago does not have some type of 'bridging' needed for X-10 to completely communicate around the entire house (just 1/2 of the house at a time). 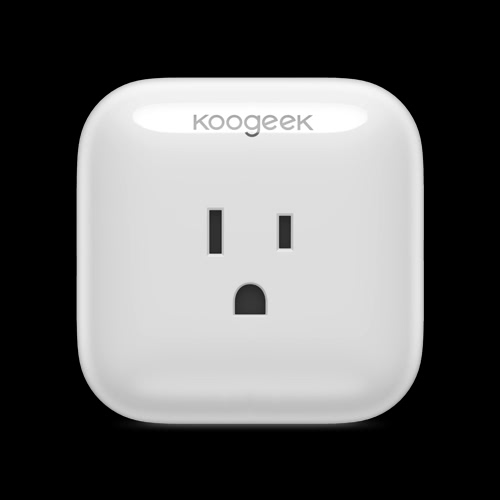 I don't really understand that, as told to me by an electrician, but really like that the Apple HomeKit (and this neat smart plug from Koogeek) has no problem operating at all. We have this hooked up to our TV and, if we end up staying out later than planned, it is nice to know that we can just command Siri to turn on the TV and it makes it seem as if someone is back in the living room watching the tube. excellent. Very recommended. Go for it. This is going to sound weird but I love this little device. It is so neat to be able to use Siri with it. Right now I have a lamp plugged into it. My husband came home and wondered what I had plugged in the wall outlet. I said, “Watch this” and told Siri to turn on the lamp and she did it. He thought it was pretty cool as did I. Honestly the possibilities are endless as to what you could do with this smart plug but personally I wouldn’t recommend plugging anything too expensive into it as it is not a surge protector. It was super easy to setup. 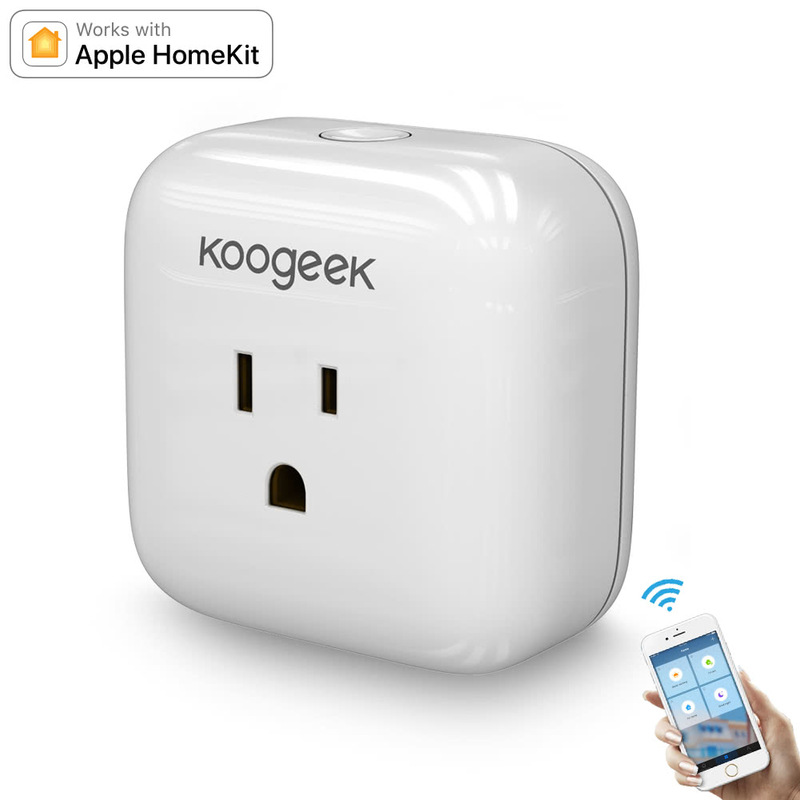 Be sure to download the “Koogeek Home” app from the app store. It took less than five minutes to get it set up and useable after installing the app and registering. Be sure to not through away the instruction manual as it has a code that you need inside of it. All in all I could play with this smart plug all day. It is really cool. 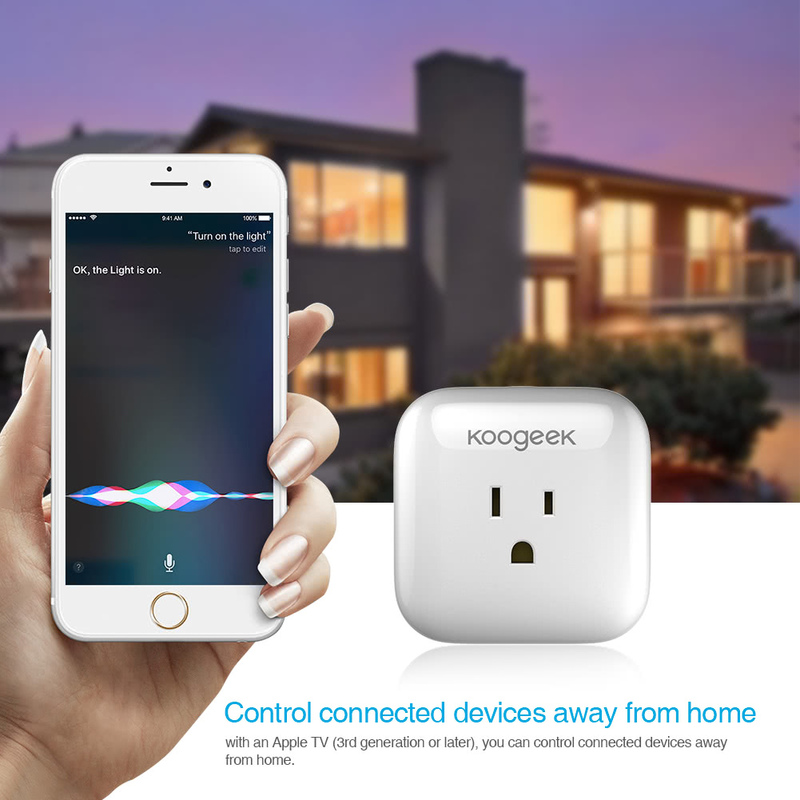 Koogeek Smart Plug is a Wi-Fi-enabled smart wall plug, which lets you control, monitor, and schedule connected devices even when you're not home, with Siri voice commands, schedules and timers, or a few taps on the free Koogeek Home app. It also can check whether your Smart Plug is in use and monitor electric energy consumption. Just as it is stated above, this small plug is powerful! But i got confused while connecting the plug with my phone. the first time i connected it very successfully, then i take it to my friends home, who was so interested in this plug. No connection and red LED light flashes all the time. After turn to the customer service, i made it! If you change a wifi environment, you need to reset this plug by pushing the button 10 seconds until it turns green!!! In fact, it writes on the instruction paper, but i ignore it! Anyway, nice item! My friend has already ordered one; he is looking forward to control most devices within his room too. The little thing looks so cute! It is small but functional. It works with my iphone and homekit. 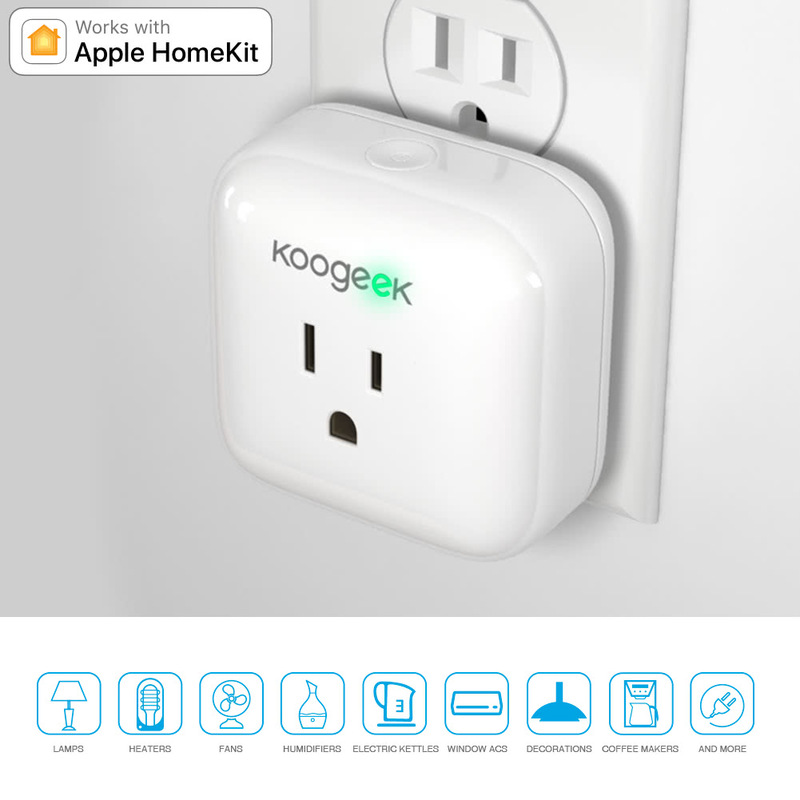 If you want a simple plug that works with apple homekit, this is certainly a 5 star product for you It is easy to set up; simply plug it on any power plugs, then tap to turn on/off button, the “e” , i mean the LED light will display green, then you can connect your phone and the product now! 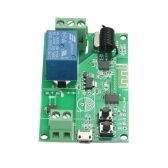 You can use this plug to control any devices you like, such as lamp, fans and more. As a test, i named my lamp as “lamp”, then i just said”siri, open the lamp”,it lit. And i set a timer: 9:30-open the lamp, 9:35-close it. Really works! I have tried so many times, it’s soooooo.....convenient that I’m thinking about getting another one. I named several devices, and I control then by saying the orders. Is it amazing? I love it, really really love it! What attracts me most is this product works with Apple HomeKit and Sir! 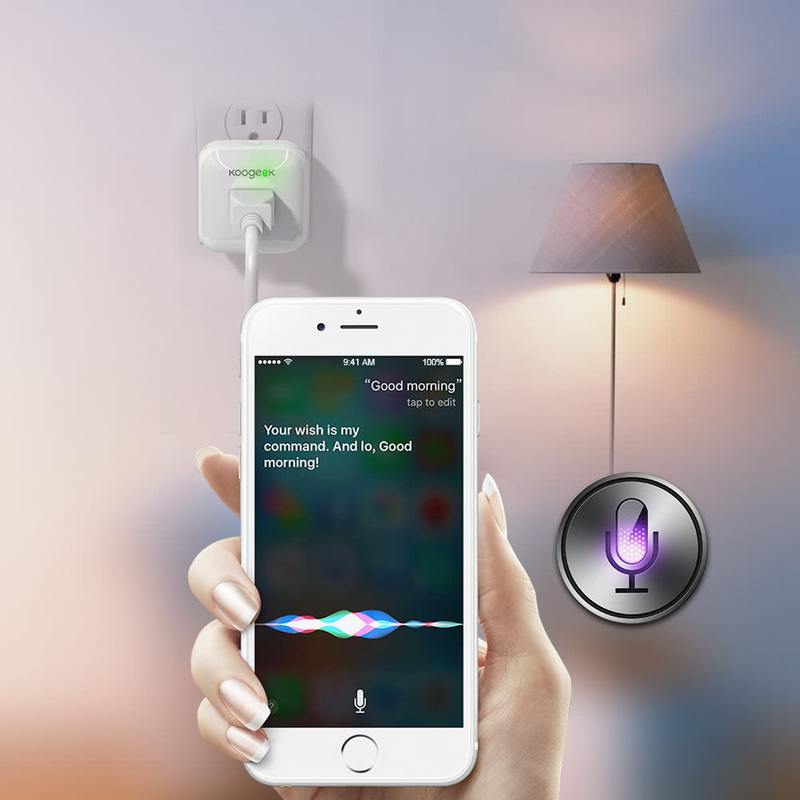 You just need to turn on/off Smart Plug connected devices or activate scenes with a single Siri voice command directly from your iPhone, iPad, iPod touch. This software setup was quick and very easy. 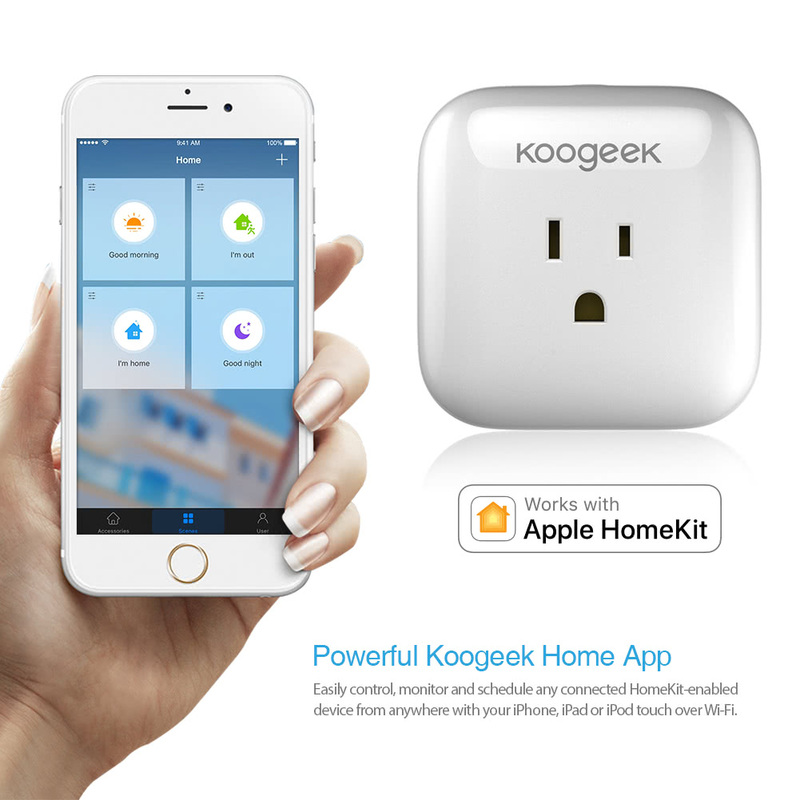 You are able to down koogeek home app within APPLE STORE, then install it! What’s more, with personalized scenes, you can manage several devices and control them simultaneously. And you can also see how much electricity your devices cost! That’s cool. I'm not sure if this thing is fun or useful or both, but I really like it. 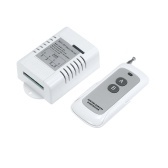 I use this smart plug to control the beside lamp, air humidifier and radio at the same time in my baby’s bedroom. You may be confused how the little thing could control three or more devices at one time. The point is a power strip!!! You can just connect a power strip on the smart plug. Then you are able to connect several devices on the strip. That’s what I am doing now. Really recommend you guys to do like that! Well back to the last point: I named the lamp “Lamp”, air humidifier “Air” and radio ”radio ” ,then i created two“scene”: good morning and good night. Each morning, when I heard my baby crying, I just say “siri, good morning”, then I will not hear any crying! These functions give more time to me before I get up to take care of my baby. You can’t imagine how important it is for a mother! Such a nice product! Really good idea,good product. 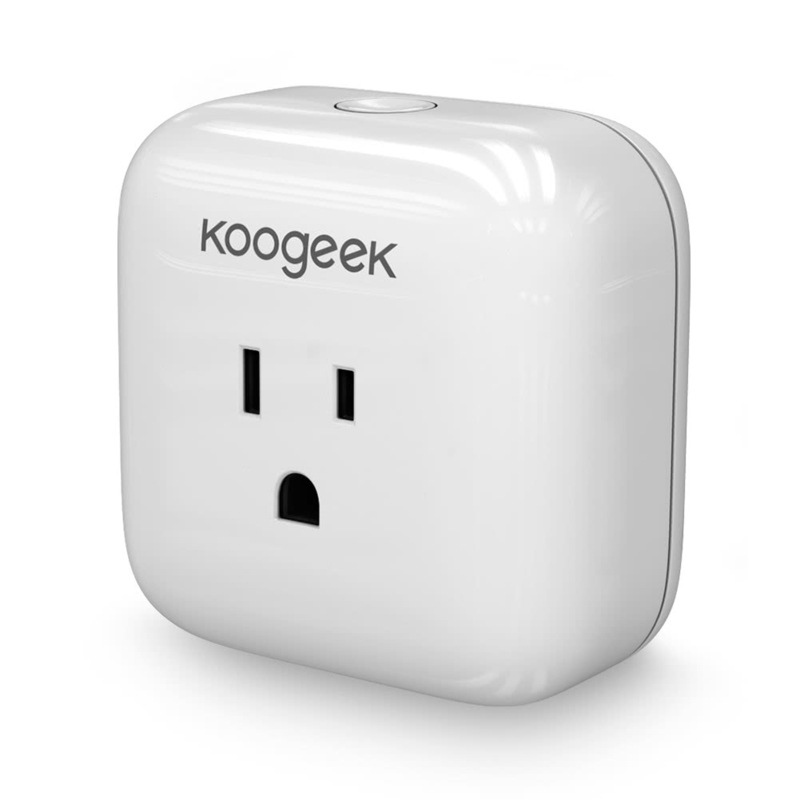 I got the chance to try out the Koogeek Wi-Fi Smart Plug.